VIPAccessEXCLUSIVE: Consummate Actress And Singer Idina Menzel Interview With Alexisjoyvipaccess At The 2016 Latin American Music Awards! Idina Menzel has also brought out many masterpieces of albums including “Holiday Wishes” and “I Stand.” Each one of her marvelous songs has a special meaning to both herself as an artist as well as her fans. Her music can make fans feel a way they have never felt before and when people say that music can change a person’s life, that statement certainly stands true for all of Idina Menzel’s songs. Now, as Idina just recently released her new album, “idina.” it continues to be something we all are listening to over and over again and it’s an album that holds a special place in everyone’s heart. Idina Menzel actually became the first ever person to have both a Billboard Top 10 as well as a Tony Award for acting. There is no surprise there as Idina Menzel is someone who has and continues to make a remarkable impact in the entertainment world. The consummate actress and singer has been a part of many sensational projects including Wicked, Rent, as well as being in shows like Glee and her upcoming project titled Beaches with an air date set in 2017, amongst many others. Idina Menzel has definitely made an unforgettable impact in everyone’s life. So, when you hear the name Idina Menzel – what do you think of? Her versatility as an exceptional actress? Her flawless and captivating singing voice? Her unprecedented successes? One thing is for sure, whenever we hear the name Idina Menzel we always think of the musical genius who has brought so much light, laughter, love, and happiness to all of the music, movies, and shows we love. 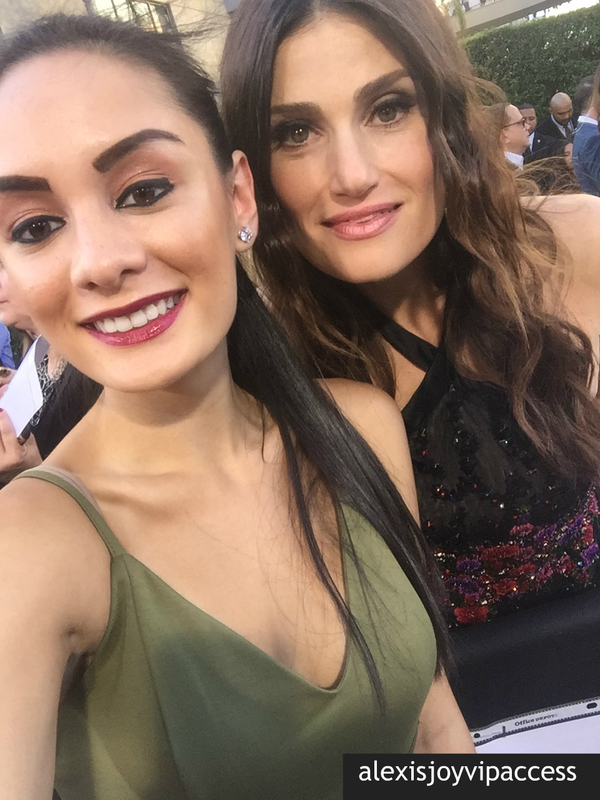 I, Alexisjoyvipaccess had the greatest honor of covering the renowned and prestigious 2016 Latin American Music Awards and had the utmost honor of interviewing the stupendous Idina Menzel at the event. Idina Menzel talked exclusively to Alexisjoyvipaccess all about what are some of her pre-show rituals before a performance as she had an extraordinary performance at the Latin AMAs, what her favorite song is off of her album, and so much more only in our VIPAccessEXCLUSIVE interview. Idina Menzel even sent out one incredible message to all of her fans – hear what she had to say in our VIPAccessEXCLUSIVE interview below. Thanks for the wonderful interview, Idina! Check out my VIPAccessEXCLUSIVE interview with the ravishing Idina Menzel at the 2016 Latin American Music Awards below! Follow @LatinAMAs and @Telemundo on Twitter and Instagram and join in on the conversation by using #LatinAMAs! Previous VIPAccessEXCLUSIVE: The Stupendous Dvicio Updated Interview With Alexisjoyvipaccess At The 2016 Latin American Music Awards! Next VIPAccessEXCLUSIVE: Alexisjoyvipaccess Attends Nicholas Brooks’ Screening Of His Movie “Sam” – RECAP Here!